I used to think that I didn’t like coffee. I’m a tea drinker, and although I love the smell of coffee, the taste has always disappointed, often bitter and with a lingering aftertaste that I hated. It turns out that what I dislike is bad coffee. In Rome, I was presented with a giant bowl of latte as part of breakfast every day and I loved it. 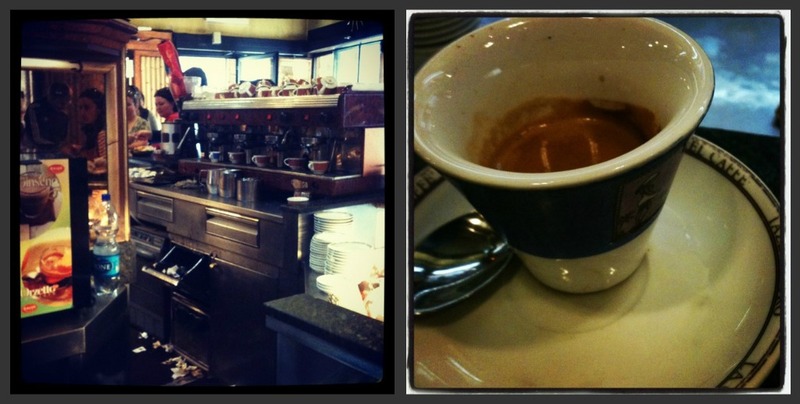 Spurred on by this, we hunted down several espresso bars during our trip to try them out. One of my favourites was right next door to the Pantheon. Called Caffe Tazza D’Oro, this bar was full of burnished wood, brass fittings and regular local customers alongside us tourists. It’s a well known place and was bustling with customers on our visit, so had a great atmosphere. You paid at the till, then took your ticket to the bar where your coffee was made fresh to order. I loved it, especially watching how the coffee was made and it’s given me something of a taste for espresso as well as a curiosity about how great coffee is made. Luckily, the city I live in is undergoing something of a coffee renaissance. Several independent coffee places have opened up in recent months and years and they’re serving great coffee. I had my first coffee back in Leeds after my Rome trip at Brewbar Espresso and it was made with obvious care, beautifully presented and lovely to drink, without any hint of the bitter aftertaste that has put me off coffee in the past. Each coffee place in Leeds has their own unique twist and I’m going to do a proper review of them all in another post, after I’ve been on a coffee crawl! In the meantime, you could read this great review from Mondomulia, who went on the first Leeds Coffee Crawl, here. I’m always going to be a tea drinker, but now coffee has turned into another option, rather than something I would completely avoid. Having never, ever had coffee from a chain like Starbucks (something I’m actually a bit proud of, considering their dominance over the market) I am very happy that Leeds now has an independent option, where coffee is made and served by people who have a passion for what they are doing and want to spend time chatting with you about the coffee they are serving. It’s the start of an education for me, and I’m looking forward to learning more. I like that you went to a culinary capital to review your coffee quoible! I know exactly what you mean though. There are certain coffee chains whose cappucinos I can’t bear because they’re so bitter. But a good coffee is the absolute best thing. Haha – yes, Rome was amazing!